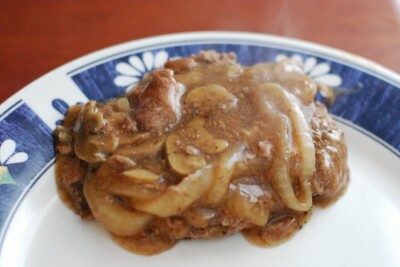 I have this thing for Salisbury Steak too. My Mama’s recipe is rockin’, but sometimes a girl needs to get her gravy on. Can I get a witness?! Beef and gravy together? That’s true love. Gravy love! My gravy love! I need ya, oh how I need ya, love! This recipe is a different take on my Chicken Fried Steak…which just so happens to be an older recipe on the blog so it has canned cream-of soup in it – before I got religion…I mean, before I learned about MSG. HA! Okay, that was funny, y’all. Cube steak holds a special place in my heart. It’s tender. When cooked right, it just falls apart and melts in your mouth. Are you slobbering yet? I am. MEAT! It’s so good it doesn’t require chewing…and after a long day, I don’t have much time for chewing. Unless it involves chocolate…or peanut butter – then I can totally chew. I used beef…but I think I’ve seen pork cube steak too. That would work. I love pigs too. They’re just so stinkin’ cute – and delicious. Just don’t use tofu. No tofu here. Thanks. I’m in a rare mood, can you tell? I’m going to stop here and give you the recipe before I say something dumb and make a zillion people angry. Amen. 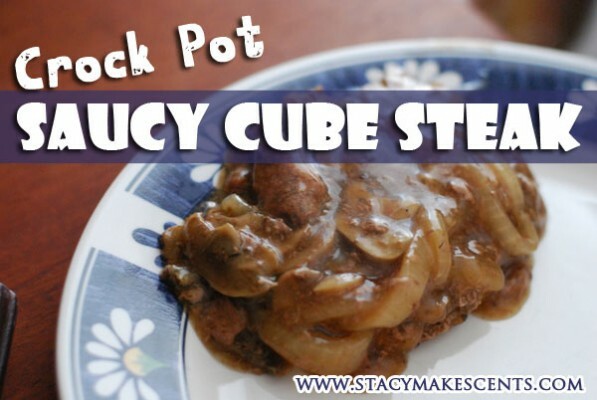 In a 4 quart crock pot, place cube steak in bottom – overlapping as necessary. Lay onion and mushrooms on top. Combine broth, garlic powder, salt, thyme, and Worcestershire. Pour over meat. In a small bowl, combine arrowroot and water. Remove steak from crock, leaving vegetables behind. Keep steak warm. Stir in arrowroot mixture. Let thicken with lid on. This was exactly the recipe that I was craving. I haven’t had this dish in years! can I make this in my 3.5quart slow cooker instead of the recommended 4quart? I actually just made this and somehow it was a lil too salty. But tender. Will make again, but will tone down the sodium. Thank you for the recipe. 🙂 I’m the Queen of Salt – Barry says I make a lot of things too salty. Ha! Ok.. I just have to say… My friends in high school called my dad The Meat Man. We also had a picture hanging in our guest bathroom of cubed steak on a skewer and it said “Beef, It’s what’s for Dinner.” 🙂 Ok, just had to live those memories on your blog. I like your dad. We should be friends. This looks yummy! Another commenter mentioned not having to brown the steaks. I’m w/you both & HATE this step (ain’t nobody got time for that!). Because you’re skipping that step, is the meat still pink or does it brown in the crock pot? Not sure my hubs would eat the meat w/the gravy on top so if it isn’t done looking I know he won’t touch it. Hooray! Steak was on sale yesterday. Now I know what I am going to do with it! Slobbering? Yes!! Going in my meal plan? Most definitely! Love me some beef, thank you! ALSO, is there enough gravy to serve with mashed potatoes? If not, what do you usually serve with this? Yes, there is plenty for mashed potatoes. 🙂 I just served the gravy over the meat. It would be good with noodles too. How long does it take the gravy to thicken? Do you leave the crockpot on low or turn it up to high? Thanks, this sounds perfect! We don’t use those cream soups because 3 out of 5 of us are allergic to milk. That’s rough – I have a friend allergic to milk…it’s hard, I know. You are hilarious, as usual, and this sounds great. FINALLY!!! A crockpot cube steak receipe that does not require browning before putting it in. Maybe I am lazy but having to pull out my frying pan and browning before it gets in the crockpot is just wrong. This is on the menu for next week. Thanks so much, Stacy. How did you know that I just defrosted a pack of cube steak??? I think this will be dinner tonight! Way to go Stacy!!!! Butcher shops actually have a machine (it looks sort of like a toaster) that you drop the pieces of steak (a less tender cut, like round steak) into the slot and then it is scored or cut by small blades and comes out at the bottom. The scoring cuts the connective tissue and helps tenderize the meat. As Stacy mentioned pounding also helps with tenderization and shortens the cooking time. And makes it sooooooooooooooooooooooo tender. Hello, Elvis. Man in America they have soooo much more options than lil old new Zealand! 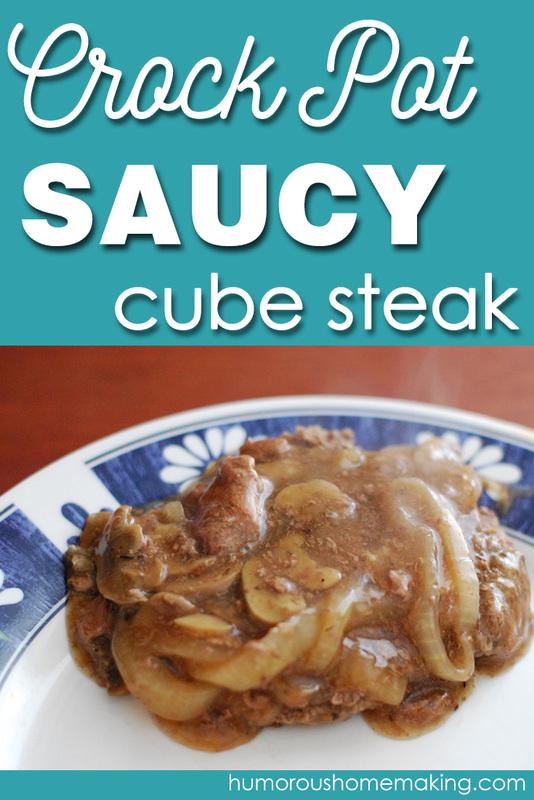 WHAT is cube steak? 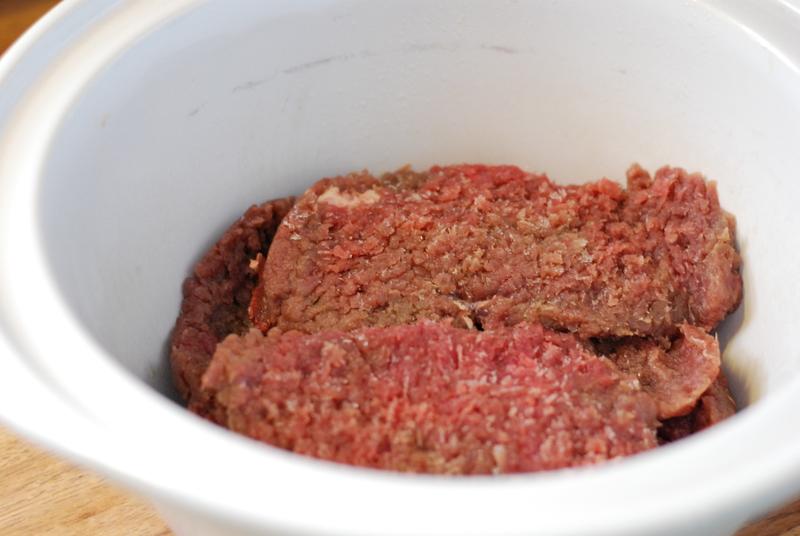 It looks a little like mince….. Well I mean ground beef to you guys? Well, it’s also called Tenderized Steak and Minute Steak. I think it’s just pieces of beef that are really thin and have been pounded so they’re very tender. You could make it yourself by pounding some thin steak with a meat mallet. 🙂 Enjoy!!! Thanks for that Stacy. Di, I saw minute steak at Pak n Save the other day, if that helps. Its round steak cut very thin, half inch. The butcher runs it through a special machine to tenderize it. You can get do it yourself with a thin piece of round steak and a mallet!